These doors are always open for you. As you read a book, surf the Internet, or just relax, it’s up to you to decode the secrets of this home. CONs: The real story of this house might cause heated debates among friends and family. 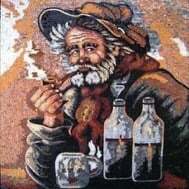 This stunning mosaic art is perfect as a mural for any office, bedroom, living room, or dining room. Our mosaics are made from natural marble and stones, naturally resistant to different environments (dry, moist or wet) and weather conditions (frost, sunlight or extreme heat).